Anilao (in Mabini, Batangas) has always been my family’s go-to spot for diving, ever since my parents’ scuba heyday in the 1960s. 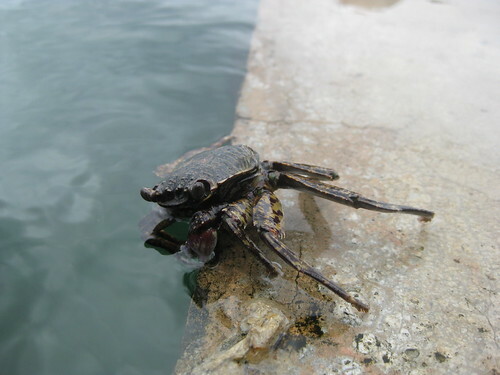 When I was a kid we had a nipa-and-bamboo house at a ramshackle, sparsely-amenitied bungalow resort called Seafari, from where we could launch a speedboat or hire a banca to take us to area dive spots. Today, Seafari is gone, and Mom wisely decided instead to book a resort which provided both diving and other non-scuba activities for Amy and my brothers’ significant others. So she picked Eagle Point Resort. Somewhat isolated from the Anilao resort strip, the approach to Eagle Point starts in the hills of Bagalangit, further down Batangas Bay, branching off the main road to a narrow, winding jungle driveway leading to a parking lot, just the midpoint from where an Isuzu Elf shuttle takes you to the resort. From there, a clubhouse and open-air restaurant (called the Main Core) sits between two sections: the older cabana-and-cottage resort, and the more conventional Terrace Hotel, where we stayed. Eagle Point has a dive shop and staging area with concrete boat dock and equipment rental office, three swimming pools (two connected by water slide), a small aviary of native birds, and a a walled-in saltwater habitat by the bay, for snorkelers to look at coral, groupers, baby sharks, and other wildlife. 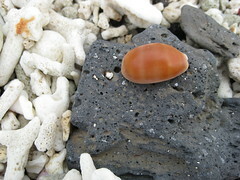 The habitat is somewhat necessary for non-divers who want to get in the water and experience some of the local marine life, as the beach by Eagle Point is rather rocky and difficult to swim or snorkel from. 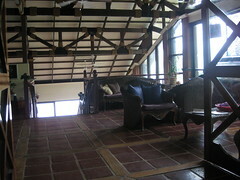 Our hotel rooms were furnished heavily with bamboo, large and clean, featuring open balconies facing the sea. I noted that some bed headboards fitted badly around building supports jutting from the wall, such that the headboards leaned awkwardly over the beds, but this was no great trouble. Housekeeping came to clean every morning, leaving two complimentary bottles of distilled water per room each day. A few cable channels come through via satellite, and there was even free wifi in the Main Core, though cloudy days tend to degrade signal. Bathrooms had hot water and a nice big shower area, which was very nice. The resort has a divemaster and advisory dive instructor on staff, both old scuba veterans of the area. For experienced divers there were no stringent requirements; the divemasters checked certifications, gave recommendations, and helped out with boat and equipment rentals. Otherwise we were free to dive without need for supervision — a requirement we have run into at other times. 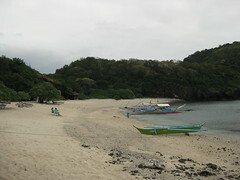 In addition to the main resort, Eagle Point has acquired Sepok Beach on neighboring Maricaban Island, where they’ve built a “beach center.” This location, about a thirty minute banca ride from Anilao and within view of nearby Sombrero Island, provides the sandy beach venue missing from the main resort. The area also features a few picturesque walking paths through light seaside jungle to other rocky beaches on the peninsula, punctuated by the ruins of earlier resort moorings. 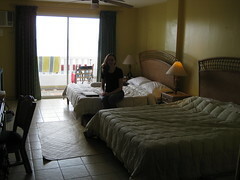 We stayed for four days through New Year 2009. I tend to hate New Year in the Philippines, and this was no exception. Let’s just say that when you set up firecrackers and bottle rockets at a beach resort, common sense dictates that you point them out to sea for safety, not at the resort so the guests can see the explosions better.